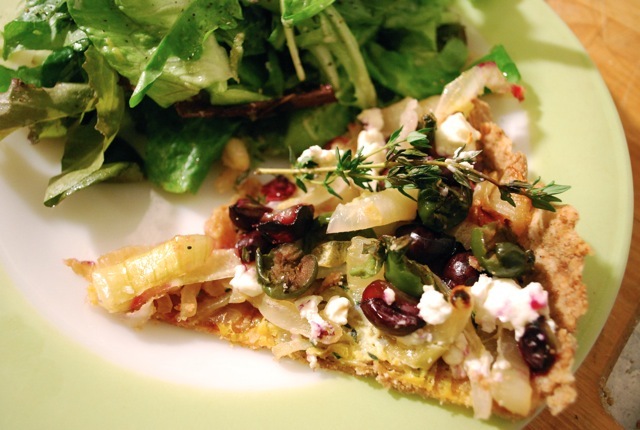 A savory tart this time, our inspiration was the a-maz-ing concord grapes in season right now. These grapes have an intense grape flavor that I only thought came from a factory. They're like grape Jolly Ranchers. They do have two downsides, though; the first is the seeds, there's a few of them in each grape, and the second is the skins--they're thick compared to the soft inside of the grape. Not to worry, the tart solves both issues because you de-seed the grapes, and the baking renders the grape skins pliable and delicious. Savory grape dishes are kind of a thing right now, and when you taste it, you can see why. They stand up really well to anything salty. We put them on pizzas a while ago, but nothing compares to local grapes picked at their peak. Besides grapes, we used some Consider Bardwell Farms chevre, vivid green olives, caramelized onions and heaps of fresh thyme. Pretty much anything you pile on top of a good crust is going o be good, so experimentation is key. Pre-bake the tart shell and allow to cool. When you are ready to bake the tart, preheat the oven to 375 degrees. Fold the onions onto the shell and then drizzle a lightly beaten egg. Scatter the grapes and olives all around, and then the thyme. Bake for 25 minutes, or until the juices are just starting to ooze from the grapes. Remove from oven and drop teaspoons of cherve all around, then bake for another 15 minutes, or until everything seems set and the crust is not burned. Cool for 10 minutes and then serve with lightly dressed greens.